Here are a few different quotes from people who have worked with Neil. Lucky & Flo, the world's first DVD-sniffing dogs, are fantastic crime fighters and a source of great pride to the Motion Picture Association. These remarkable canines, who can sniff out counterfeit DVDs hidden in large cargo shipments and behind padlocked doors, were trained by Neil Powell. We selected Neil after a thorough search for a world-class trainer. Neil has a reputation for excellence and professionalism, which he richly deserves. Because of Neil’s unique skills, we have turned to him to train more canine crime fighters. Neil Powell is highly regarded by fellow trainers throughout the world, and is certainly held in the highest esteem by all of us at the MPAA. Thank you so much for coming to help us and coming such a long way too. We really appreciate it. Caesar is walking really well and not pulling anymore. He stays sitting when cars go past and has stopped lunging out at them, it's not a chore to take him walking anymore now and he is like a completely different dog. I would just like to thank you for the wonderful change in behavior of my staffordshire cross, Jade. She no longer attacks other dogs and is a pleasure to walk. I was so glad that I found your name in Yellow Pages.I had been searching for a dog trainer for such a long time and when I saw your name, I couldn't believe it. My little jack Russell Meg is now walking properly to heel and has stopped attacking my shoes and trouser legs. She is a delight to take out with me. Thanks again. Carol and Nick here from Kilcurry, near Forkhill, you came out to us to help with our problem with our two female Yorkshire Terriers. Well, it's a changed house here. We're walking them every day (weather permitting) which is a great bonding experience for both us and the dogs. There are no dogs allowed on the furniture. The two females are still trying to dominate each other but no major injury's. Anyway it's a far cry from keeping them in totally separate rooms. We just wanted to thank you so much for all your help, you have really opened our eyes on so many things. Anyway, it's work in progress, but thanks to you we are a lot more optimistic and confidant with our pack. I can't tell you how grateful we are for the help you have given us. I would like to thank you on behalf of my mother and myself for all your help and advice during our recent troubles concerning Scooby. The court case took place on Monday 2nd and I am pleased to say that although we received a fine, the destruction order that was placed against Scooby was reduced to a confinement order, which basically means he is to be kept on a lead whilst being taken for a walk. During the short court session the judge commended you on your report and the advice you give us to ensure Scoobys’ behaviour improved. To some people the lengths we went to ensure Scooby was not put down may have seemed extreme, but he means a lot to all our family and we would have done anything in our power to ensure he was kept alive. This task was made all the easier for us with the professional and courtesy way you treated the entire situation. 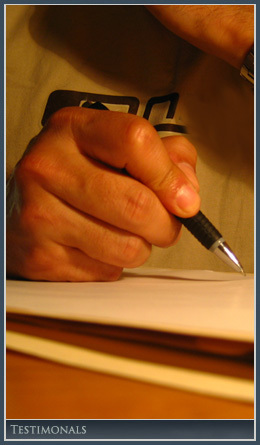 I wanted to write this letter as sometimes it can be hard to express gratitude with just a quick phone call. Again thank you for all your advice and assistance. When our dogs started biting people we knew we had a serious problem and needed your expert help. You rehabilitated our 2 dogs and trained us in how to handle them properly - in a gentle way. You showed us how to set boundaries with the dogs and also guided us on how to be the pack leader. Your training has made an amazing difference to us and our dogs everyone is calm, balanced and happy! Just a quick note to say thank you for your visit last week and your advice on how to go about re-training Larsson. It has only been a week so far but the changes in him already are nothing short of amazing. He no longer goes mad when a child comes to the door. He is a lot calmer in general in the house and he is walking beside us outside with very little prompting. Obviously he still has a bit to go and has little relapses from time to time but we feel that it is just a matter of sticking with the programme you set out and he will be fine. We will give things another couple of weeks and then perhaps get you to come back to the house to do a review of his behaviour and look to see if there is anything else we can be doing to develop him even further. Once again thank you for your very simple and practical help. It has made such a massive difference to our Larsson. You visited my family this summer regarding our labrador Benny. We have Benny since he was 8 weeks old. At three months old there was absolutely no way we could take Benny for a walk on a lead. Every time we tried to put a lead on him, he went completely out of control, barking, whining and then retreating to a corner. It was as if he has previouly had a bad experience of some sort. Neill came highly recommended. We contacted him and he fitted an appointment in around us, he was very accomodating. Within 15 minutes of Neil meeting Benny he was well on the road to recovery. Although Neil said that Benny was probably one of the most terrified dogs he had come across when it came to dog leads, he had such a way with Benny, it was amazing to watch. Now, Benny goes for long walks every day and absolutely loves it. He is transformed. Neil had all the time in the world, is clearly a natural with animals but also has that something extra that sets hom apart from other dog trainers. 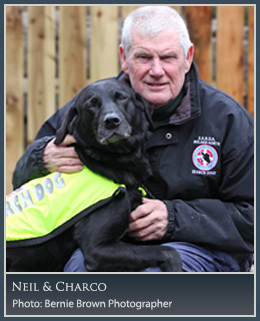 I could not recommend Neil enough - your dog will love him! I just wanted to thank you for all the time you spent with us yesterday. It was amazing how quickly a "proper" dog trainer/behaviourist can have results! I appreciate that the hard work is only beginning but it is nice to feel we are now heading in the right direction. It was very nice to meet both you and your lovely wife. Just to say thanks for the training and advice you gave, my dog is a different dog now and with plenty of practice he can only get better. I will be advising anyone with a dog to visit your class so they can see what a difference it makes. It's hard to believe it's been almost a week since you visited our family to help us with training our Yorkie pup, Buddy. We'd like to thank you for taking the time to share your expertise with us. We thoroughly enjoyed it and we learned so much! I am pleased to say that things have been going very well since your visit - Buddy is sleeping all night in his crate without going to the toilet and he mostly "does his business" outside now. Ill keep in touch, if that's ok, and let you know how everything is going and hopefully get a follow-up class with you in the future. After receiving a letter from the Council about our barking dogs I got in touch with Neil. We had tried everything to get them to stop including the shock collars so he really was our last resort. Thankfully, it was the best decision we made. We just wish we had contacted him sooner! Neil was able to establish the reasons for their behaviour and wrote out a detailed plan on how to fix it. We started to see progression within the first couple of days and things have been great since. I would recommend his services to anyone with similar problems. Neil, What can I say? Sandie, my beautiful 19 month old Labrador gave everyone outside the family a wide birth and would literally have gone into a mouse hole rather than meet anyone. She was OK with other dogs. Since you visited her in my home we joined your class in Bessbrook. And now, after just three sessions she is a totally transformed dog. When we were out walking today she didn't try to hang herself to get out of reach of people - she didn't exactly make a beeline for them either. She had a ball in class tonight and entered the arena with her tail going at 'ninty to the dozen'! You have made her a star! I just can't thank you enough for your help, advice and methods. Copyright © Neil Powell, 2008 . All Rights Reserved.